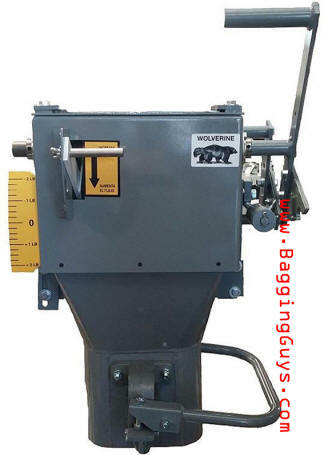 The "Wolverine" scale is our most economical gross weigh bagging scale. Grossweigh Bagging is a weighing process wherein your product is weighed directly into its final container - a bag in this case. The Wolverine is a gravity feed, gross weigh scale designed to fill non-dusty, free-flowing products into 20# to 110# bags. The Wolverine Scale's weighing mechanism is about as simple as it gets! Simply hang the empty bag on the cam-grip spout, then pull the trip lever to start the filling process. A mechanical counter-weight / counter-balance system automatically shuts-off product flow when the desired target weight is reached. Designed for filling almost all Open-mouth bag styles - Kraft Paper, Multi-wall Paper, Polyethylene, Woven Polypropylene, and Burlap / Woven - gusset and non-gusset. Great for products like plastic resins, prill fertilizers, rice, salt, cous-cous, seed, grain, corn, dry feeds, and many more! For Uniform, Non-dusty, Free-flowing Products Only!